…and how passion and identity inspired me to push beyond our own limitations. As a developer for Quadshot I can say I am proud of our successes in revitalizing some great, classic sites and we have become well known for our ability to “manage old content.” As a team we’ve brought older, yet still relevant content back to life with a fresh new look and feel. These “survivor sites” as I like to call them, harken back to a time when the kinks were still being worked out of the technology and the rules were rigid. So, now they might have content that no longer fits, spilling out of “old-school” tables and divs. Content that battles with outdated css that had to comply to Internet Explorer 6 or graphic files that have been re-sized so many times their pixels look “worn out.” Luckily many of these layouts have managed to survive multiple experiments to make the content wider, but then suffered when everything had to be shrunk fit a mobile display. Maine Today did not exactly fall into the desperate state as described above, but it did have a look that it was “out growing its cage.” It desperately needed breathing room and it was my task to do the preliminary analysis of their code which should have been a pretty straight-forward task. They are a simple variety news/life style site, right? Right, kind of. At first, the project didn’t appear as complex on the surface as the kind of enterprise level conversion Quadshot regularly does, but it was a complex project and I didn’t realize that it was as complex as it was until I started to read their content. I mean, I really read their content. I know this might sound like an obvious step to some, but we live in a world with “spinner” articles, scraped and reused content, RSS feeds form “authority” sites and well, just plain ol’ bad writing. A quick digestion of the material would be my norm. A fast read wouldn’t do in the case of Maine Today’s content, however. It couldn’t do because I saw that the actual writing holds value. And when I say that, I do not mean, good grammar or fancy prose. What I mean is that it has that thing that makes a difference in art, journalism, song writing, visual media or your cousin’s band. That thing you can’t just go out and buy. The writing at Maine Today has “VIBE”. Check it out- within restaurant reviews and the Top 10 Places to Pumpkin Pick is a distinct voice that reflects the unique character of Mainers, as the residents of Maine have lovingly been dubbed. During the discovery, or planning phase, we met via phone conferencing, created conversations in Basecamp, a project management software, then met in person. Although Maine Today used the expression “blog” during conversations, I could see they were really taking on much more of a unique vision. It was more like a hybrid editorial site, mixed with the features of a “listings” site, like a Zagats and Yelp, but without the nonsense or complication of either. 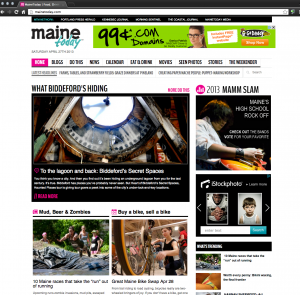 The Maine Today team had adapted to creating for whatever they needed, in spite of their old sites limitations. If they had an idea on how a page should look nothing stopped them. They created content as-needed and were not afraid to learn and experiment. This too resonated with me as a characteristic of I now associate with Mainers. They are not afraid to try new things, in fact they seemed to put all their weight into the learning curve and have fun at the same time. This lead me to rethink about how content is presented and created. How could we have Freedom + Flexibility + Stability existing in the same place? Usually I insist “people must do it right”. The way the software intended to be used. I am kinda a “stick-in-the-mud” when it comes to that stuff. However, the Maine Today team inspired me to push beyond everything I knew about WordPress and look for opportunities for freedom uncover core features that would allow flexibility and leverage WordPress’s simple, built in database and layout structure to to provide stability. We could maintain practical standards, but create some great user experiences for their editors. And ultimately, their readers benefit. Of the many unique solutions/features we developed, a Post-to-Post style relationship process standouts as my favorite. On their old site writers would create entries that would mention the names and addresses for local landmarks or businesses. An example being, The 10 Most Beautiful Places in Maine. That post would list the location information of 10 places. The problem I saw was, if a later entry like “The 14 Greatest Places To Picnic” was written that might mention 5 out of the 10 Beautiful Places, the editor would be faced with finding the locations again, taking the chance that it could be copied incorrectly, info had changed, etc. There was no “normalization” or “on-board” reference. To resolve this, we began by leveraging the core features of WordPress Custom Post Types to create a “Places” post type that acts as a repository of reusable information about local businesses, geographical locations and landmarks. This would include, street address, web site, a reservation service link, latitude and longitude, web link, etc. The editors could add as little or as much info as they wanted. Then, via the admin search feature, the editors can find the information for a “place”, then use a “Pulldown Menu” to show as much or as little related information. So, in say a post called, “8 Outstanding Beer Only Bars”, Joe’s Bar and Grill may only display the name and address of the location, but in other another post, as long as other info was entered, they could show a “Directions Link” or a “Call For Reservations Button” and more. NOTE: * I am from Los Angeles – I have never even heard of apple picking. That is when I started to push the limits of how to handle a variety of situations regarding content, how it is displayed and what flexibility means to a creative person, but particularly when stability would be the normal requirement. Also, because I can chew gum and do Sudoku at the same time, I thought about how fun it might be to go Apple Picking. Although looking like a standard Post-to-Post relationship feature, our Places concept grew and became better for it. It made story topics like: 10 Must Attend Summer Concerts, 5 Amazing Places To View The Sunset and 12 Great Places To Play Pub Quiz much easier to handle, as well as a story topic that might shine light on a single, up coming event like the North Atlantic Jazz Festival. Also, another reality- Google is smart, and if a post contains an outdated address for a location, it will drop from the rankings. This way, even older reviews, posts and editorial lists will always have the latest location information. Sweet! The above is an example of using WordPress Meta Fields to create Post-to-Post relationships. It simply is saying, you will create a new post, then find a set number of other posts that will be associated with it. This then brought up another challenge- thanks Peter and Shannon! Could the reverse happen to create a category or river page or a listings style page. Again, another time-saving way to create some consistent content, but having the flexibility to display it in different ways on the site. Genius! The answer was resolved by Quadshot’s own Dino Termini- who by the way, is always a true rockstar at every step. Dino went to work and created some stellar conditional statements and created some pretty amazing custom “Post-to-Page” templates. We even slipped in the ability to have two distinct custom formats: a Grid version and a “single column stacked” layout. So there are two “solutions” that grew out of inspiration, and yes, the entire process was a brain teaser, and yes, it was a fun brain teaser. And I am grateful for the opportunity to meet and read about Maine, Maine history, and especially the residents of Maine. I discovered “Mainers” think so far “out-of-the-box”, there isn’t even really a box and it was an honor to help support that kind of ingenious spirit. Although I am speaking in the first person in this article, these solutions were truly a team effort and many thanks some of the other Quadshot Team: Dino Termini, Mike Cremean, Chris Webb and Tom Smith who contributed ideas to the solutions for this client. And of course to WordPress, giving voice to all kinds of ingenious spirits. Plugins that made this solution more obvious: Advanced Custom Fields, Custom Post UI and CPTaxonomies.